If you really want to make your special someone feel, well, special this holiday season, Dolce & Gabbana L'Eau The One is the way to go. Ever since I discovered this beautiful scent, it's made its way into my seemingly overrun collection. I love the warmth it exudes -- it's perfect as we head into what promises to be a bitterly cold winter. This scent is fresh without feeling zesty, close without feeling cloying. It's light, crisp and utterly sensational. Dolce & Gabbana builds on the original fragrance by adding fruity notes to the warm, Oriental-floral heart. The swirling combination of notes includes bergamot, mandarin, lychee, peach, plum, floral muguet, jasmine, madonna lily, amber, musk, moss, vanilla and vetiver. The bottle is somehow delicate, sensual and substantial all at once. The weighty glass silhouette is topped off by a gleaming silver stopper that lends it a subtle, simple elegance. 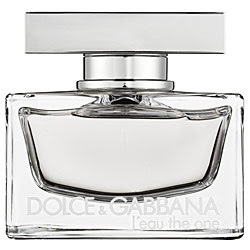 Dolce & Gabbana L'Eau The One retails for $60-$82. I love this stuff. My current bottle is almost done, so I will be restocking very soon. I never do that with parfume. I usually try and find something new, but not this time.